Jason had been craving this for a solid two weeks before we had a chance to make it from this recipe. Despite the hot oil concerns, it was pretty easy and absolutely delicious. Sprinkle 1/4 teaspoon salt and 1/4 teaspoon black pepper evenly over steaks. Set aside. Combine cracker crumbs, 1 cup flour, 1 teaspoon salt, 1/2 teaspoon black pepper, red pepper, and baking powder into a shallow dish. Whisk together 3/4 cup milk and eggs. 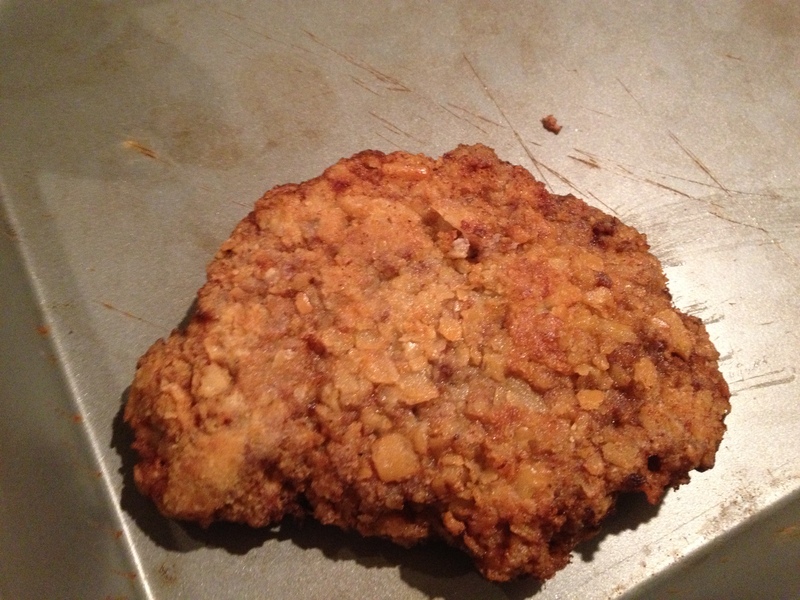 Dredge steaks in cracker mixture; dip in milk mixture, and dredge again in cracker mixture. Pour oil into a 12″ skillet; heat to 360 degrees (do not use a nonstick skillet, we used the cast iron skillet). 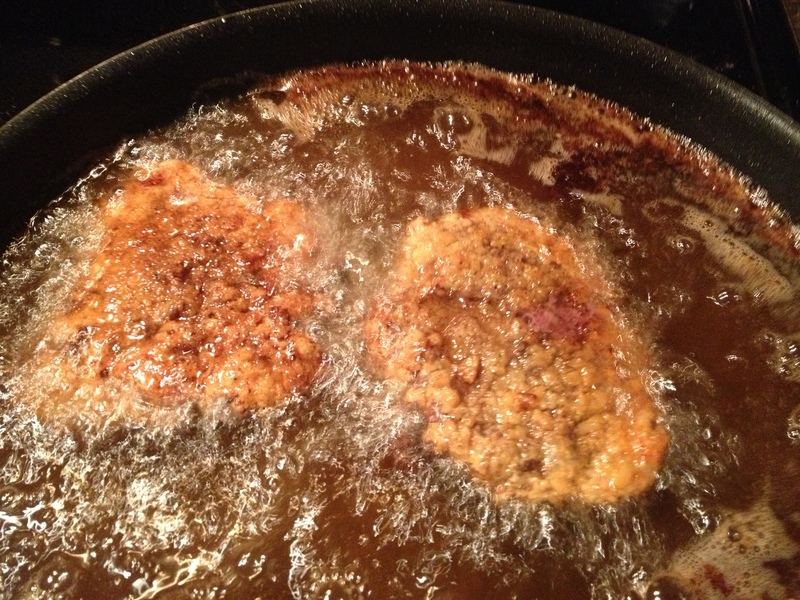 Fry steaks 3-4 minutes. Turn and fry 2-3 minutes or until golden. Remove steak to wire rack over a cookie sheet to let it drain. Keep steaks warm in a 225 degree oven. Carefully drain hot oil, reserving cooked bits and 1 tablespoon of oil in dripping in skillet. Whisk together remaining 4 cups of milk, 1/4 cup of flour, remaining 1 teaspoon salt, and remaining 1 teaspoon black pepper. Add milk mixture to reserved drippings in skillet; cook, whisking constantly, over medium-high heat for 10-12 minutes, or until thickened. You’ll think this is never going to come together. Keep whisking. After about 5 minutes it should start to come together. Whisk for a few minutes after you think you should stop. Should be a light grey color at first and darken slowly. 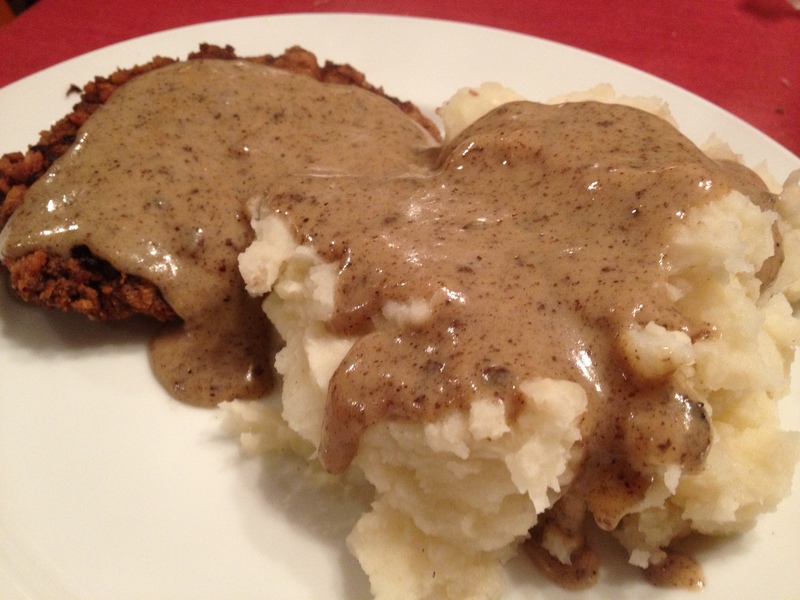 Serve gravy with steaks. Disclaimer: Be careful draining the oil. And don’t send it down the sink! Find a metal coffee can or other receptacle to help with this. Obviously, hot oil is hot. Be careful! As for the dish, it’s the right amount of salty and rich. I don’t normally love gravy, but topping the steaks with this gravy makes the dish. It’s even better the next day, though not as crispy.